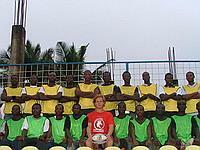 Projects Abroad volunteers are helping to promote and improve rugby skills in Ghana through our rugby sports programs. Volunteer William Shepherd is currently volunteering in Cape Coast, and is coaching a newly formed rugby team called Oguaaman Ocean Warriors - the first team of its kind in Central Region! William's main role is helping at training sessions - taking fitness sessions, line-out drills, tactics and team structure. The project provides a really hands on approach to coaching and has allowed William the freedom to use his own training methods. Volunteers are also encouraged to bring forward their own ideas to help with the development of the team. An example of this has been William, along with the other volunteers, working to set up the first league and a tournament in the region. They have been trying to raise awareness of the sport in the area, organize matches and build a sustainable structure for the future.